2017 is drawing to an end and what a year it’s been! We hope you have had a year of growth and productivity. Over the last few months, AMT have been writing a series of blog posts ranging from brief descriptions of Microsoft apps, to in depth explanations of how to use certain tools to improve your business, or an element of your business. As it is the last Tuesday post of the year, what better way to celebrate than to give you a final roundup of our top 5 blog posts! In 4th place we have ‘How do you collaborate in Office 365’. This post was a real hit on LinkedIn and sparked many conversations between IT professionals. 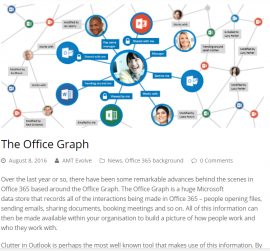 It talks about the many different ways in which you can communicate and collaborate using Office 365 and how it can improve business. Topics covered in this post are; organising documents, working together on documents, running a project and cross-company communication. 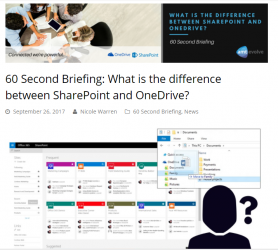 In 3rd place is a 60 second briefing, summarising the difference between OneDrive and SharePoint. These apps can often be compared as they essentially do the same thing – store documents and files. However, there are very strong differences between the two, and this post summarises these differences very clearly and simply. Read this post and you’ll have it sussed. 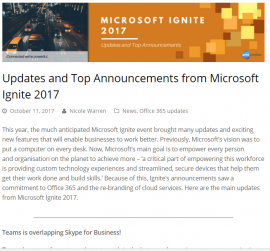 And in 1st place is the Microsoft Ignite 2017 updates! This year, the much anticipated Microsoft Ignite event brought many updates and exciting new features that will enable businesses to work better. Previously, Microsoft’s vision was to put a computer on every desk. Now, Microsoft’s main goal is to empower every person and organisation on the planet to achieve more through ehanced communication and collaboration – Because of this, Ignite’s announcements saw a commitment to Office 365 and the re-branding of cloud services. Here are the main updates from Microsoft Ignite 2017. 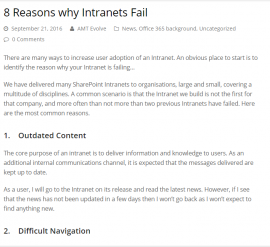 We hope these blog posts have been informative and have shown the ways in which Office 365 works to improve communication and collaboration within businesses. If you have any questions about anything you have read, or would like us to cover a topic, either on the blog or on the webinars, please do not hesitate to contact us and we will be happy to help! previous post: 60 Second Briefing: What is Dynamics 365?